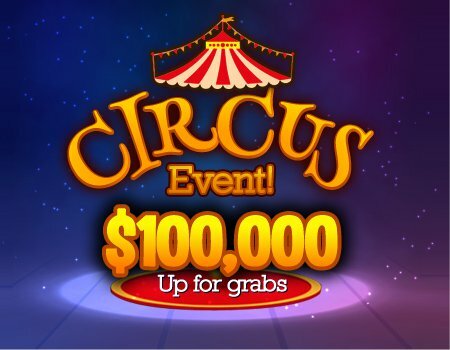 Step right up this March for your chance to take part in the $100K show extravaganza. With the smell of popcorn in the air, players are invited to head over to our Main Room to bingo on our circus patterns to win their share of the massive jackpots playing at random all month long! Every time you win one of the ‘Circus Bingo Games’ (Rings of Fire, Clown, Flying Angels, Giraffe, Popcorn, Cotton Candy and Little Man) you will get 1 point into the weekly ranking, besides the game jackpot of course. Plus! Each week players will take part in a random draw or top 5 ranking for a chance to win extra prizes and $1,000 grand prize entries. I like casino games better…Do I qualify? No worries! If Bingo is not your thing we still have you covered. To enter, just play any of our famous casino games from March 1st to March 31st and spin your way to great jackpots. Each week players will take part in a random draw or top 5 ranking for a chance to win extra prizes and $1,000 grand prize entries. At the end of the month, we’ll combine all weekly rankings (Casino & Bingo) and randomly select the lucky $1,000 Grand prize winner. Remember the more entries you collect, the higher the chances of winning. Be sure not to miss any of our performances since you could win extra CASH, as each special game holds fixed jackpots of up to $250 CASH and a chance to claim the $1,000 CASH Grand Prize at the end of the month! See you in the bingo rooms! This entry was posted in Blog on Mar 11, 2017 by Canadian Dollar Bingo.